When walking in downtown Hangzhou, China, one can safely expect to see a healthy variety of pedestrians, traffic, and commercial high rises. Dig a little deeper, however, and you may also find locals and tourists belting out Beethoven’s Moonlight Sonata on a rainbow-colored piano next to the Hangzhou Theatre. Fortunately for music lovers, this scene isn’t an anomaly. Thanks to an art installment called “Play Me, I’m Yours,” these seemingly impromptu sessions of casual piano playing have been happening in cities across the globe, including Sao Paulo, Santiago, and Mexico City. 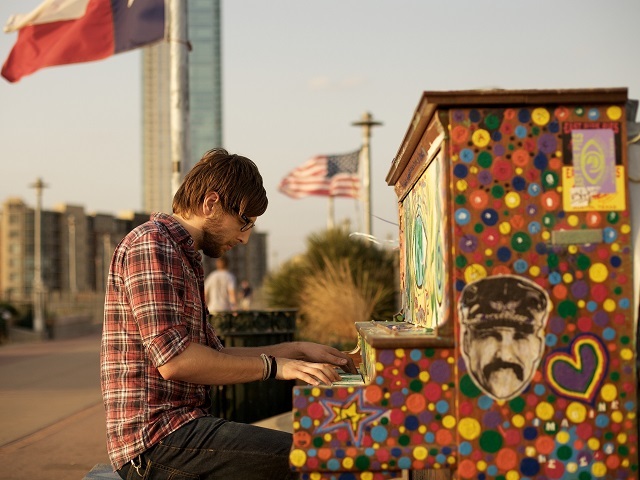 Created by British artist Luke Jerram in 2008, “Play Me, I’m Yours” is an initiative that installs publicly accessible pianos in major cities by coordinating with residents and local art institutes. Once a location is found and a piano is installed, local artists are invited to transform the musical instrument into a work of art with whatever resources they have. As a whole, the project operates at the intersection of art, music, and urban space to foster a sense of community and inspiration that can positively impact neighborhoods. Indeed, each piano even has a dedicated page on the organization’s website, allowing individuals to share their stories and connect with others in the area. Furthermore, after weeks of being open for public use, each piano is donated to a school or local group at the community’s discretion. 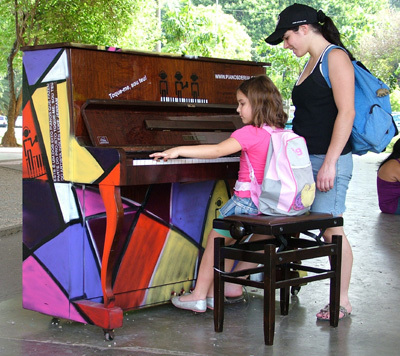 Beginning its legacy in 2008, Sao Paulo was the first South American city to install the street pianos, and remains the only Brazilian city to have worked with the project. Since 2008, over 13 pianos have invaded the streets, markets, and parks of the city, reaching thousands of people—and creating stories. 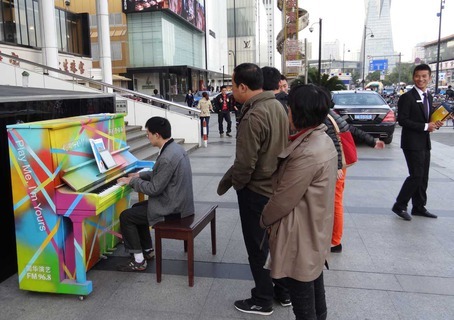 Hangzhou, China partnered with the initiative in 2012 and installed 18 pianos which were decorated by students of the China Academy of Art. To jumpstart the city-wide project, Hangzhou held a launch ceremony featuring performances by residents and Li Yundi, the winner of the 2000 International Frédéric Chopin Piano Competition. After being publicly available for ten days, the pianos were given to local schools for music programs. In 2014, Mexico City used the project as an opportunity to band together The Ministry of Culture of Mexico City and Crescendi—a civil society group dedicated to promoting the arts—to customize 20 pianos for public use. After strategically placing the pianos across the city, the groups held lectures and talks to encourage individuals to become more involved with the music community. Leonardo Miron, the director of Crescendi, noted that “anyone who visits these places and encounters a piano can…discover his musical talent,” signaling their aspirations for community engagement. While this art project has impacted millions of city dwellers across the globe, “Play Me, I’m Yours” more importantly demonstrates how public spaces in urban areas can be used to develop communities and connect residents. Indeed, the art installment has grown from a small piano lending program to a global initiative that brings local governments and residents into a conversation about how to manage public events. To get “Play Me, I’m Yours” to come to your city, click here.